Sprint on Wednesday announced plans to launch the Novatel Wireless MiFi 2200 device in early June. The device will cost $100 after a $50 mail-in rebate, bundled with a new two-year service plan. The MiFi 2200 — which Sprint will relabel the “Sprint Mobile Hotspot” — connects to Sprint’s 3G cellular data network. It creates a localized Wi-Fi connection that any Wi-Fi device equipped can use — Mac laptop or desktop, iPhone, iPod touch, PC, game console and more. 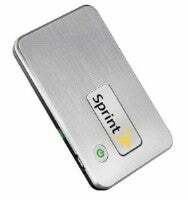 The Sprint Mobile Hotspot measures 3.5 x 2.32 x 0.35 inches and weighs 2.05 oz. It’s equipped with a brushed aluminum finish and provides mobile broadband Rev A Internet access. The Wi-Fi supports up to five devices simultaneously, with WPA2-PSK, WEP and SPI Firewall security. The built-in battery provides up to four hours of runtime, or 40 hours of standby on a single charge. Sprint anticipates the Mobile Hotspot will be of interest to businesspeople who travel together and want online access without needing to find an open or pay-to-play Wi-Fi hotspot; students looking for mobility; and retailers looking for a portable system they can use to run point-of-sale systems from.